BY TOM CURRY The right choice could make a big difference while the wrong choice could be a disaster. 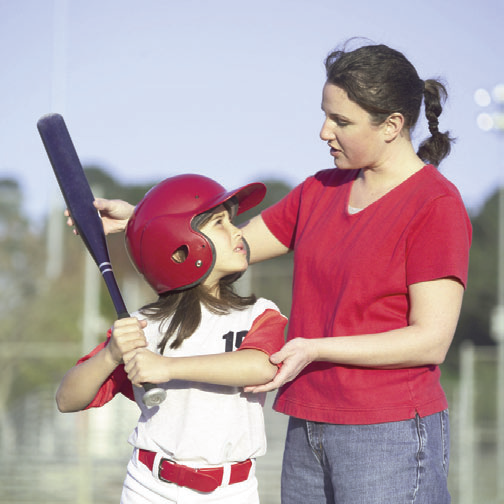 Many parents these days struggle with choosing an instructor or individual coach to help develop their child’s athletic skills in a particular sport. The pressure from other parents and the success, or lack of success of their children, may have a powerful influence on you when selecting an individual instructor for your child. The many clinics, schools and sports programs vary, in size and cost, from sport to sport. Lessons simply are not a panacea for any child who wants to play at the high school and college level. Here are some things to consider before stepping into a costly program. 1. CHECK THE BACKGROUND OF THE INSTRUCTOR THOROUGHLY BEFORE PLACING YOUR CHILD IN THE PROGRAM. While this sounds like a no-brainer, some people rely too much on word of mouth before making a decision. Googling the instructor’s or coaches name and finding out as much information as possible will help you make a more informed decision. 2. VISIT THE INSTRUCTOR’S FACILITY AND WATCH HIM OR HER TEACH. Are you comfortable with their teaching style? Will your child be comfortable with their teaching style? 3. WATCH AND LISTEN! Does he or she use appropriate language? Do they knock other instructors or camps/clinics? Are the skills being taught at the proper level for your child? Is there a progression of skills being taught? 4. ARE FUNDAMENTALS STRESSED? There are no magic pills in sports. Proper fundamentals reinforced each lesson must be taught, practiced and mastered. 5. HOW MANY CHILDREN ARE IN THE CLASS WITH YOUR CHILD? Or is it a one on one program? You certainly do not want to put out a lot of money and not have your child receive enough attention during the session. What is the student to instructor ratio? 6. HOW MANY TIMES A WEEK DOES THE INSTRUCTOR WANT YOUR CHILD THERE? How many times are you willing to take your child there? Is this going to affect your family life, and at what cost? 7. DOES THE INSTRUCTOR PROMISE “OFF THE CHART” RESULTS? College scholarships? Starting on the high school team? This is unprofessional and something to be wary of. There are many factors that go into making a high school team. Many of these factors are ignored by these instructors who just focus on skills. College scholarships in some sports are scarce and the fact is that most schools at the Division 1 level carefully recruit the high schools before giving away a costly athletic scholarship. You simply cannot promise those types of results. 8. VALUE! How much are you willing to pay for quality instruction? Many times, parents pay a lot of money for professional instruction when the high school coaches’ summer session may prove to be more beneficial to the child than a more well-known camp or clinic. Ask about sharing lessons with another youngster. Lessons without practice are useless. In addition, and in most cases, practice without lessons may be just as useless. Practicing the wrong things over and over without some idea of basic fundamentals is just a waste of time. It is also best to remember that all the skills in the world do not help in every situation. Your child must be able to use those skills in competition. This means they have to play against good competition to be ready to face good competition during their team’s season. One story that comes to mind happened at a nearby school a few years ago. The parents paid a lot of money for their son to take wrestling lessons. After a mediocre high school season, the parents blamed everyone for their son’s lack of success. They had forgotten one simple fact. While the lessons helped their child technically, they had neglected to get their child into some summer wrestling tournaments to raise his competitiveness and skills during tough matches. In another case I know of, our county had a tennis champion that never took anything but very basic tennis lessons. She won a county championship while playing against much tougher competition because she simply refused to lose. She was a very tough and successful player in basketball and softball. She simply used that competitive drive to help her overachieve in tennis. She refused to lose! Her competitive instincts amazed everyone, and opponent after opponent went to defeat because she simply out-toughed, out-hustled and outplayed those players that had taken scores of private lessons. Lastly, be very wary of the clinic instructor who is constantly criticizing the local high school coach or offering suggestions counter to the success or success of the coach and the team. This could present a major conflict for your child. One year, I had a player who went to a particularly vocal individual trainer. I saw the player talking to that coach at half-time of our game. I didn’t start the player in the second half. Midway through the third quarter, the player asked me what was up. I asked him what his individual coach had told him. The player stated that he had told him he had to look for “his shot” more. “Great,” I said. “What did I say we had to do to win this game tonight?” “Get the ball inside to Peter,” he said. “That can’t be done with you looking for your own shot! Who are you playing for? Him, yourself, or the team? When you decide, let me know!” With that I turned back to the game. The kid later came down the bench and said he apologized and that that would not happen again. And it didn’t! The individual coach asked me what was up after the game. I explained everything to him. I also asked him not to attend any more games if he was going to be a real source of irritation to our program. He agreed to rethink his message to kids (partially because he didn’t want the word out about what had happened), and did change his message to his constituency. Funny thing happened. He later became a high school coach on his own and was adamant about individual coaches not undermining his program! Tom Curry has been an Athletic Director in Bergen County, New Jersey, as well as an adjunct professor in the Wellness and Exercise Science Department at Bergen Community College for 24 years. He has coached high school basketball and golf and was voted Bergen County Basketball Coach of the Year in 2002. He has spoken at the New Jersey Medical Society Sports Symposium and to parent groups on various issues pertaining to youth sports. He was inducted into the NJ Coaches Hall of Fame in 2012.